Wales in October is an annual fixture for us. The week before the clocks change, while teatime is still daylight. In the cloudless skies we’ve been having, you could say an excess of light; the west becomes an unfocussed dazzle. But what glory when gold touches the hills, the trees, and in the river the patient anchored boats. And what a privilege it is not only to walk in this landscape, but to have a hand in shaping it. A forester is almost alone in being able to make the boldest and most immediately obvious alterations – not always to universal applause. A clearfell on a hill is as radical a change as flipping the flap or ‘slide’, as Repton called them, in one of his Redbooks. But of course irreversible. If people approve of (most of ) what we do in Wales it is because we are felling the dark masses of Sitka spruce and replanting with more sympathetic species – or in most cases mixtures of species. The immediate aftermath of a clearfell is inevitably a mess: logs and stumps lying higgledy-piggledy among piles of brown brash. We usually plant new trees within a year, straight into the mess. For two or three years they are scarcely visible, as the mess subsides and turns grey. Then your eye picks up the lines of green and recognises oak, larch, spruce or pine or beech or Douglas fir, softened by a haze of self-planting birch. Within five years the hill is green again. Our concern now is about larch. 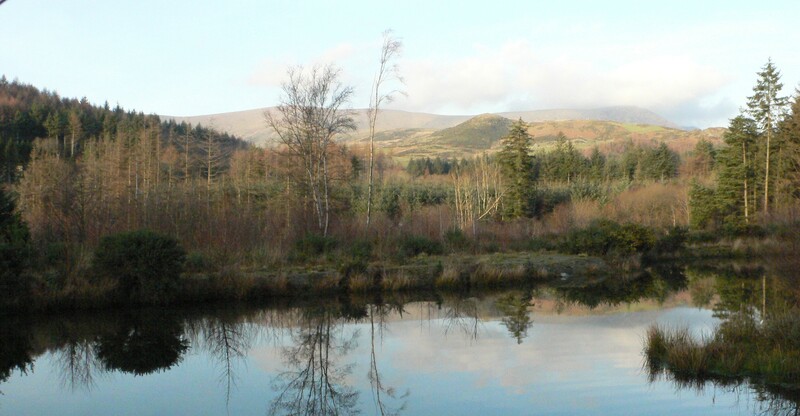 Phytophthora ramorum has already cost us a considerable plantation. Now we hear of a new disease, being referred to as ‘Red Tongue’, that can kill larch from the roots up (the phytophthora starts at the top). Larch, after oak and beech, are our favourite trees, holding their feathery heads, now brilliant yellow, high aloft on pencil-straight trunks and showering everything below with weightless golden needles. They are also some of the most fecund trees; their pale seedlings come up everywhere, little lights in dark corners. Anything that wiped them out would be a tragedy. For the moment we are concentrating on the streams that chatter or slide, and occasionally rush, down their little courses to gather in the Afon Dwynant in the valley, and gurgle on through the trees, eventually to the estuary. We are clearing a path along its whole length, as close to the water as possible, sometimes bridging it, sometimes diverting round a mossy sheep pen or a veteran tree. The music of the water is a cocoon around you as you walk, shutting out the world as the stream dances and glitters at your feet. I’m not a particularly adventurous gardener, as you may have observed. We simply don’t have room for many experiments. The roster of plants in this garden changes little from year to year, and I have certainly talked about our favourites often enough. So if there is any news, it is new introductions. Or rather Hatches, Matches and Dispatches. You might not think Rozanne, the deservedly ubiquitous violet-purple geranium, could easily be muted. She normally sprawls with abandon, insinuating her cheerful flowers everywhere. Not under the sycamore, its shade enhanced by roses and fuchsias and a lusty camellia. Poor Rozanne struggles underneath. The fuchsia, the albino form of F.magellanica, never fails to sprinkle the gloom with its delicate little bells, the playground, surely, if we have one, of flower fairies. The Garden Museum exhibition of Cicely Mary Barker’s Flower Fairies had us all entranced, from grandfather down to a four-year-old boy more given to fire-engines than flowers. Matches. One colour-match that proves again that 2+2 can = 5 is the blue potato bush, (sadly now no longer a Solanum but renamed Lycianthes rantonettii) as a climbing frame for the yellow Clematis orientalis. The purple potato flowers have yellow centres; the harmony is complete. Hatches are new arrivals. More geraniums to decorate Grandpa’s (Alitex) Shed; dark red Lord Bute, incendiary Rimfire and our favourite, Aldwyck, whose shade of red I can’t describe, They came as plugs – and within a month have flower-buds. A fastigiate form of the holly being touted as a box-substitute, Ilex crenata; not very impressive. A yellow-berried (at last) variety of Nandina domestica – ‘at last’ because I collected the seed in the botanic garden at Kobe twenty years ago. And of course bulbs. London was worryingly as warm as Tuscany when we got home from staying with friends in the most perfect summer-cool garden near Montalcino. Their house, vineyards on one side, olives on another and an oak wood on a third, is blessed with a gushing, crystalline, never-failing spring. I have always dreamed – really dreamed – of living where water springs from the ground. Here it flows down little stone channels into glinting basins, chuckling as it goes, then takes another run and spouts in crystal arcs into basins big enough to plunge and wallow in. It’s cold of course, but under a Tuscan sun the ultimate luxury. It is not easy to keep your bearings on the endlessly winding roads of Tuscany. All the ancient settlements are perched on hilltops reached by a series of hairpin bends. The campanile or farm or orderly olive grove you take as a landmark gyrates around you as you follow the road in countless twists, in and out of the shade of oak or pines, then dazzling sunlight. The wide Val d’ Orcia comes as welcome relief, a definitive break, a broad pause in the confusion with the signature profile of Monte Amiata blocking the way to the south. Villa La Foce is perhaps the nearest Tuscany comes to a stately home, at least in its setting, a near-English garden poised like a balcony looking south across the valley with the summit of Monte Amiata in its cross-hairs. It is famous as the home of the Origo family, where the author Iris Origo lived through the Second World war and wrote War in the Val d’Orcia. TheMerchant of Pratois her unique account of a Tuscan merchant’s life in the 14thcentury when she found his correspondence in the 1950s. The Origos employed Cecil Pinsent as their architect, as Bernard Berenson had at Villa I Tatti, so they can hardly have been looking for a totally Tuscan result. To blend the orderly intimacy of English tradition with the wild breadth of the Tuscan landscape, where distances are measured in purple ranges of receding hills, is a challenge – which he overcame with the almost inevitable staircases, alleys of cypresses, staircases and hedges. 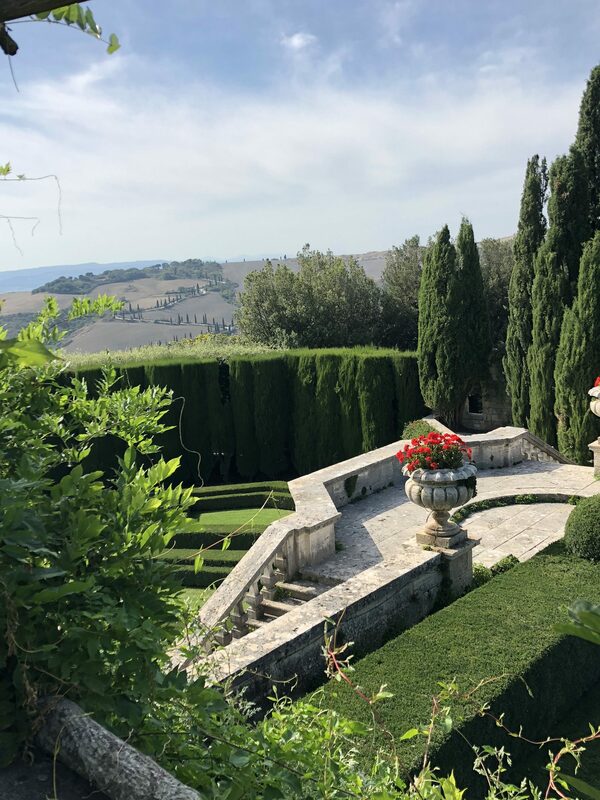 In steep hillside gardens, which almost all Italian gardens are, changes of level are the key decisions. Slopes are usually a mistake: you need to cut and construct terraces. Then you can contrast and balance intimacy and wide skies, detail and bravura. French windows (is there anything more Engish?) on to rosebeds, cloistered plots, vine pergolas, lemon pots, fuchsias and hydrangeas……. The ingredients may be universal, but the scale and sentiment are something an Italian would not conceive. And the upkeep, the planting and the tidiness: utterly English. It’s La Rentrée (taken so seriously in France that on August 31st there’s gridlock on every Autoroute) that snaps the garden back into focus. In our case rentrée from a week in Provence at its most perfect: cool in the morning, hot in the afternoonand warm at dinner-time. No need for shawls on the terrace. I expected the countryside to be as brown as the England we saw from the plane, but most of it looked relatively fresh. The plane trees (to me one of the great sights and principal glories of Provence) were in full green leaf; very few crackling brown cast-offs on the ground. Where they have water at their roots they can grow into ivory monsters, spilling obesely over kerbs, walls, rocks. Closely set in avenues they can soar cathedral-high, pale pillars to a pale green roof. They are the glory of (for instance) the Cours Mirabeau, the Champs Elysée of Aix. Some insane official has replaced a few of them with red-leafed maples. The guillotine is too good for him. Gardening has to be simple near the Mediterranean. You can add such routine exotics as mimosa, palm-trees, oleander of course, but the basic ingredients scarcely need the gardener’s help. Pines, planes, cypresses, holm oaks, olives, an azure sky and pale stone are a full palate. The true pine of Provence is Pinus halepensis, the Aleppo pine, thought why we don’t call it the Provence pine I don’t know. By nature it is tall and slender, and even at the end of summer a pure, piercing, almost apple-peel green. 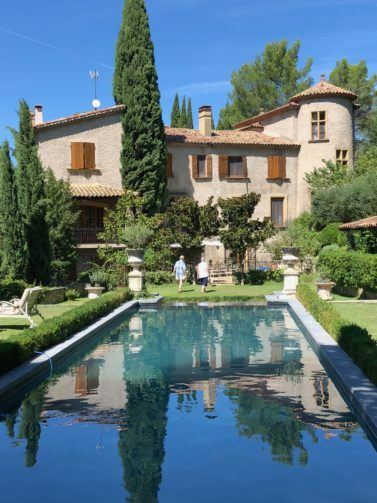 The house where we stayed once had an elaborate garden, on a pine-covered hill overlooking the city of Aix. Now most of it has filled up with the native laurustinus, which luxuriates in the woodland shade. The only level part is trim and flowery round a formal canal that doubles as a swimming pool, flowing continually over a weir into a lower basin, and lined, perhaps uniquely among swimming pools, with a low box hedge. A pool for grownups. A week away sharpens your focus when you get home. There is far more to enjoy that I expected; new flushes of roses, invigorated Clematis orientalis, yellow among the purple of the now-towering Solanum rantonettii*. Phlox White Admiral with a new lease of life, agapanthus fully out, more geraniums, but above all the incomparable (however common) Anemone ‘Honorine Jobert’. Jobert was a nurseryman at Verdun in the 1850s. Was Honorine his wife? For such a simple white flower, a nine-petal daisy, it has extraordinary presence and grace – and persistence. In Provence as in London. *Now, I’m afraid, to be called Lycianthes. Not as sad as Sophora being renamed Styphnolobium. Oh, the taxonomists’ tin ear. I have sometimes got funny looks from committed gardeners when I mention forestry. the word no doubt summons up for them a picture of hills black with spiky spruce. It is thirty years now since I first planted what was destined to become woodland (the respectable, even cuddly word, if forest is too aggressive). That first essay was on fields of dreadful, shallow, acid soil roamed by feral sheep in the centre of France. The French government, or its Office National des Forêts, was incredibly efficient and generous with advice (and grants – though why a country which is already more than ten per cent oak woods should want to pay for more I never understood). 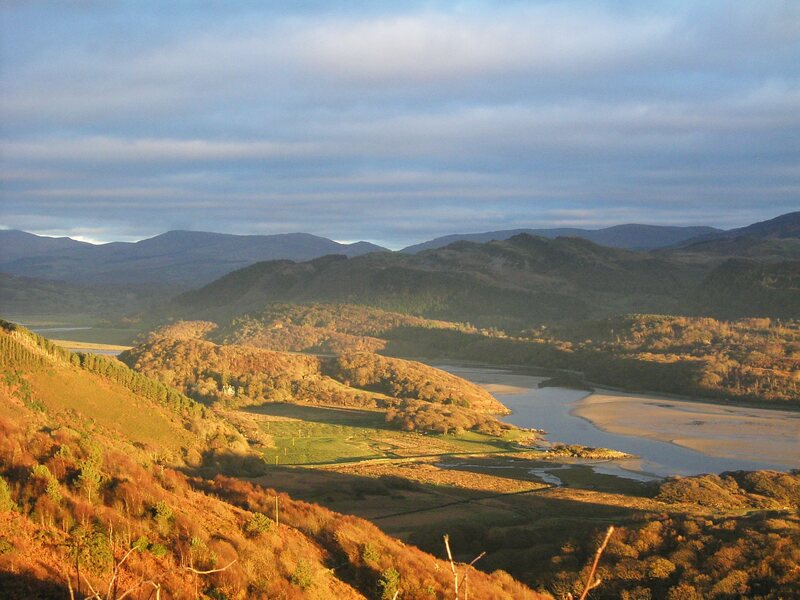 For the past 25 years our planting (and of course felling) has been in the wildly beautiful Snowdonia National Park. It has a different purpose from gardening, of course, with economics at its heart. I know I am unusual as a forester in putting landscape above profit in my priorities, but by no means unique. The two, in any case, can be perfectly compatible – so long, that is, as you have a taste for the beauty of conifers. This Welsh landscape was dedicated to sheep, criss-crossed with monumental stone walls, dotted with little stone farms, barns and pens. Along streams and wherever there was deeper soil grew thrusting ash and old bent oaks. Everywhere else it was heather and bilberry – or rushes. And far too much bracken. In the 1960’s the Forestry Commission, and an industrial Pension Fund, invaded with conifers: larch and pine in drier places, here and there western hemlock, and almost everywhere Sitka spruce. They planted regardless, up hill and down even where there were already groves of oaks or ashes – the idea being that the quick growing conifers (they can easily manage a metre a year) would simply grow through and shade out the broadleaves. In some cases we arrived just in time, almost forty years later, with many of the conifers mature, in sawmill terms, and ripe for felling. Above the battlefield of a clearfelled site rose disfigured, spindly oaks gulping for light and air. When we released them some broke or blew down; many others burst into rugged towers of leaves. There were planted plots of oak and beech, too, at forty years old just forming proper little woods. These and the veteran trees became our guide and the sketch for our future landscape. Down came the dark masses of spruce, twenty acres or more at a time, revealing the streams, walls and tracks that shaped the landscape, and providing the income to put it back together again as distinctive and Welsh. This is where a gardener’s eye comes in. There are places where deliberate simplicity sets up a strong line or mass; where in a garden you would plant a hedge or an avenue. There are tracks and paths that lead the eye into the distance or into a concealing bend. There are effective and appropriate places for water; ‘flood the hollows’, as Repton prescribed. There are prompts for open space – for instance to reveal a rock or a dramatic change of level. On the hills there are streams to reveal for the sparkle of their water through peat or over rock. There are boring bits where the best solution is to grow something productive; in the garden. veg, in the forest Sitka spruce. You can contrast the dark bulk of conifers with the open arcades of broadleaves shorn of their lower branches. Eventually the necessary thinning of larches, when they are forty feet high, produces one of the loveliest effects in the forest: their soaring straight trunks carrying graceful light canopies above what can be a fascinating understorey of seedlings and shrubby plants. Old stone walls are all the sculpture and statuary you need. We have just named one corner of the woods Hemlock Hollow, where five huge hemlocks spared from a general felling tower over a little valley and a chaotic rushing stream. Hemlocks have the most beautiful foliage of all the conifers; ranks of tiny needles of a unique clear green, almost bottle green, with their tops always a slender shoot inclining in a graceful bow. Sturdy young oaks and slender beeches shade the ground beneath them. I couldn’t call it ‘gardenesque’; it’s too simple and elemental – but it gives a gardener garden-like pleasure on a quite different scale. I suppose if there is an opposite to gardening, or rather an occupation as different as it could be, it is sailing. What the two have in common, though, is of course their dependence on the weather. Both take their cue from it; absolutely depend on it for their functions. To gardeners and sailors weather is existential. Having just been blown about the Solent, on glorious days of blue skies perfect for admiring roses, I’ll admit to being torn between the two. If sailing wins this time it is its added spice of excitement, the commotion of competition, the regatta rush of crowding boats in touching distance rounding buoys in churning water, setting a new course, the pull of the spinnaker and the rushing foam astern. Cowes Week brings together 800 boats, from dinghies to towering yachts and catamarans that slide along like skaters. Thousands of sailors speaking their strange language. It is an alternative civilisation.This August the garden, in contrast, is immobile. Cocooned in trees the air barely stirs. The burning sun makes shadows too dark to penetrate. Streams have dried to an inaudible trickle. The suspense is palpable: when will it rain? It is the time of hydrangeas; those dowdy pink knobs that clash happily with orange montbretias in dusty front gardens by the sea, and deep in the woodland the majestic domes, purple or sky-sapphire, nestling in deep-green leaves. Their name suggests water, although it seems Linnaeus was just fooling about with the Greek for a water jar they supposedly resemble. They certainly appreciate moisture in the soil. More important is its acidity – and much less easy to adjust than textbooks suggest. I have taken cuttings of a truly sky blue one and grown them in compost identical to the parent, only to achieve a washed-out mauve. You see H. Annabel everywhere these days; such an eruption of foamy white that without support it collapses in a heap. Now I’ve taken to planting the rather more realistic H. paniculata: no Fra Angelico colours, but eventually something approaching a small tree. In fact the arborescent version on a one metre trunk makes one of the great summer eye-catchers.